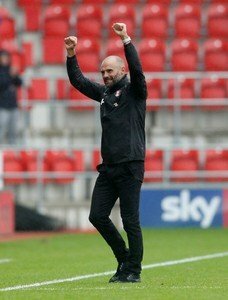 Rotherham United Manager Paul Warne told Sky Sports that his overall thoughts after the two-all draw with Stoke City was of ‘pride’. ‘I asked the lads what their overall emotion was after the game and they said disappointment but they are a dressing room full of amazing human beings who always want to do well for the club and for the town,’ Warney said. I can understand why the players felt a bit down after going two up and City ending up with a point but I, for one, came away from the New York Stadium feeling elated and pleased that my team had shown passion and never gave up for the TV game. OK, Stoke were the better side in the first half but I believe we were as good if not better from the team who have just come down from the Premier League and who still have Premier League players in their side, in the last forty-five minutes. That’s not to say we didn’t make some mistakes. Again I feel our passing needs a bit more attention but I wasn’t that impressed with the Potters passing sometimes either. In the end I think a draw was a fair result.